Following the destruction of HMS Defence, HMS Warrior escaped to the west out of the battle area where she met up with Admiral Beatty’s Seaplane Carrier HMS Engadine. With considerable difficulty, being a much smaller ship, Engadine took Warrior in tow. Warrior was filling with water and during the night became increasingly difficult to manage. On the morning of 1st June 1916 the weather worsened and it was decided to transfer Warrior’s crew to Engadine and abandon the now sinking Warrior. As an ex-cross Channel excursion vessel Engadine was fitted with strong rubbing strakes and the captain Lieutenant-Commander Robinson RNR with considerable skill managed to bring Engadine alongside the wallowing armoured cruiser. Warrior’s crew transferred across. The wounded were moved in cradles. One wounded man, a double leg amputee, slipped out of his cradle into the sea between the ships. Two Warrior officers were ordered not to attempt a rescue as too dangerous. Flight Lieutenant Rutland, the pilot of the Short 184 that had carried out the reconnaissance at the beginning of the Battle of Jutland, climbed down the side of the ship unnoticed made his way to the sailor and recovered him with a line. 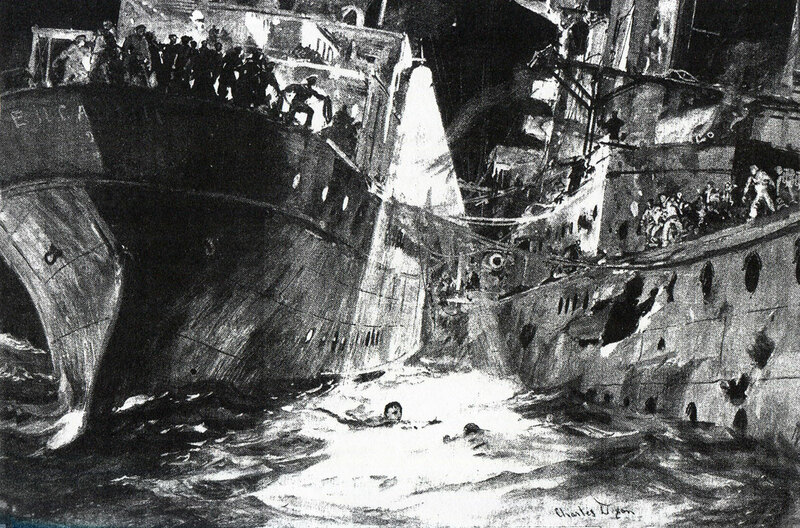 It was found that the wounded man had been crushed to death between the ships. Rutland received the Albert Medal First Class for Attempting to Save Life. Warrior sank the next night. Once the two national fleets returned to harbour each was addressed by its sovereign. King George V addressed a parade of sailors of the Grand Fleet from the deck of the badly damaged HMS Warspite. Kaiser Wilhelm II addressed his officers and sailors in Kiel Harbour. Each congratulated his navy on a resounding victory. Knighthoods and appointments to the orders of chivalry associated with the armed services were made to officers who had distinguished themselves in the battle. Commander Bingham captain of the Destroyer HMS Nestor of HMS Champion’s 13th Flotilla for the attack on the German Battle Cruisers early in the Battle of Jutland. Bingham was captured with the survivors of his crew (see Battle of Jutland Part II). Major Harvey commander of HMS Lion’s ‘Q’ Turret posthumously (see Battle of Jutland Part II). First Class Boy Jack Cornwell of HMS Chester (see Battle of Jutland Part III). Commander Loftus Jones captain of the Destroyer HMS Shark posthumously (see Battle of Jutland Part III). Some 40 Distinguished Service Orders were awarded to Royal Navy and Royal Marines Officers. Some 13 Distinguished Service Crosses were awarded to Royal Navy and Royal Marines Officers including Flight Lieutenant Frederick Rutland the pilot of the Short 184 Seaplane that conducted the initial air reconnaissance and who subsequently rescued the wounded sailor from HMS Warrior and to Lieutenant Cuthbert Coppinger RN Navigating Officer of HMS Canterbury (see ‘Coppinger of Jutland’). Some 65 Distinguished Service Medals were awarded to non-commissioned ranks including DSMs to the survivors of the crew from HMS Shark P/O Griffin, P/O Fillend and A/Bs Hope, Smith, Howell and Stoker Swan who were picked up by a Danish merchant ship (see Battle of Jutland Part III). A large number of French and Russian awards were made to all ranks. This much anticipated battle in the North Sea was referred to in Germany as ‘Der Tag’, the expression being taken up by the Royal Navy as ‘The Day’. Subsequently ‘Der Tag’ was used to describe the day the German Fleet surrendered to the British in November 1918 and was escorted to Scapa Flow, where most of the German ships were scuttled by their crews. The Grand Fleet was conducting a boxing tournament on 30th May 1916 when the orders were received to go to sea. There was a headlong rush to return the boxers and spectators to their ships. The boxing competition was conducted on board the ‘Sports Ship’ HMS Borodino with the crews of the ships brought over by drifters and picket boats. So great was the urgency to get the crews back to their ships that the Borodino went round the fleet delivering its spectators. Following her performance at the Dogger Bank Action SMS Derfflinger was given the nickname ‘The Iron Dog’ by the Royal Navy. The Germans were particularly struck by the accuracy of the firing from the British Battleship HMS Valiant. It was found during the battle that the Germans had not been able to modify their torpedoes to conceal the surface wake as the British had. It was consequently much easier to avoid approaching German torpedoes as their wake could be seen. One of the officers lost on HMS Queen Mary when she blew up (see Battle of Jutland Part II) was Commander Shimomura of the Imperial Japanese Navy who was serving an attachment on the ship Japan and Britain being allies in the First World War. The survivors of HMS Invincible were Commander Dannreuther the gunnery officer (who had been Invincible’s gunnery officer at the Battle of the Falklands on 8th December 1914), Lieutenant Sandford, CPO Thompson and three ratings. All had been in the control top and were blown clear when the ship blew up. They were picked up by the destroyer HMS Badger. Badger’s crew were expecting to pick up German sailors and were surprised to find the survivors were British naval personnel headed by a commander. Many of the British capital ships at Jutland continued to serve and fought in the Second World War. All the Queen Elizabeth battleships did so. HMS Barham blew up in 1940 after being torpedoed. HMS Warspite was badly damaged during the fighting around Crete in 1942. HMS King George V played a major role in the sinking of the German Battleship Bismark in 1941. By the Treaty of Versailles which ended the First World War, Germany was prevented from keeping any of her capital ships, other than pre-Dreadnoughts. All Germany’s Dreadnoughts were handed to the Allies, although many were scuttled by their crews in Scapa Flow in 1918. Several pre-Dreadnoughts that fought at Jutland continued in the German naval service up to and through the Second World War. The oldest capital ship at Jutland SMS Hessen continued in service with succeeding German navies until 1946 when she was handed to the Soviet Union and disappeared, a length of service of at least 43 years. SMS Schleswig-Holstein fired the first naval shot of the Second World War bombarding Danzig on 1st September 1939 (see the picture by Claus Bergen in Battle of Jutland Part I). In spite of being in the thick of the fighting from the beginning of the Battle of Jutland, the Battle Cruiser HMS New Zealand suffered no casualties and no damage. On a subsequent refit in dry dock, a dent was found that may have been caused during the battle. During a visit to New Zealand (the ship was paid for and donated to the Royal Navy by the New Zealand Government) before the war, Maori chiefs predicted that the ship would come to no harm. They presented a Maori kilt to the captain, and told him to wear it whenever the ship went into action. As the battle began, a sailor took a quick look onto the bridge, to check the captain was wearing the kilt, and was able to reassure his messmates, who took the requirement very seriously. Flight Lieutenant Rutland, who flew the seaplane reconnaissance in the opening minutes of the battle (see Battle of Jutland Part II), was awarded the DSC. His seaplane was destroyed during the Blitz in 1940. The remains of the seaplane are in the Fleet Air Arm Museum. Bodies of British and German sailors were washed ashore over the days following the Battle of Jutland at Väderöbod north of Gothenberg in Sweden. British casualties are now buried in the Commonwealth War Graves Commission Kvlberg Cemetery near Gothenburg. One of the crew members on the German Light Cruiser SMS Weisbaden was the author, Johann Wilhelm Kinau. Under the pseudonym Gorch Fock, Kinau wrote the popular book ‘Seefahrt ist nott’. After serving in the German army, Kinau transferred to the Navy and was a lookout on the Wiesbaden. A father with three children, Kinau died with the rest of the ship’s crew at the Battle of Jutland on 31st May 1916, his body washed ashore in Sweden. He became something of a national hero. Kinau was adopted by the Nazis as an important German author, although there seems to be little evidence that his views coincided with National Socialism. The future King George VI, Prince Albert, served as a midshipman in the Battleship HMS Colossus during the Battle of Jutland. He was a member of the gun team in ‘A’ Turret and came under fire. Prince Albert was known as ‘Mr Johnson’. Commander Hubert Dannreuther RN, the sole surviving officer from HMS Invincible, received the DSO, the French Croix de Chevalier de La Legion d’Honneur and the Russian Order of St Anne 3rd Class (with swords). Dannreuther, the Gunnery Control Officer on Invincible, was blown clear from his position at the top of the ship when she exploded. Moments before the end, Admiral Hood called out to Dannreuther commending him on his shooting. Dannreuther was Gunnery Control Officer on Invincible at the Battle of Heligoland Bight, and at the Battle of the Falkland Islands, when Admiral Sturdee’s ships sank the German Squadron of Admiral Graf von Spee, comprising the Scharnhorst, Gneisenau, Leipzig and Nürnberg; the light cruiser Dresden escaping to be caught in 1915. Several of the photographs of the Battle Cruiser Fleet at the Battle of Jutland (see Battle of Jutland Part II) were taken by Paymaster Lieutenant Arthur Dyce Duckworth. Duckworth was present at the Battle of the Falkland Islands, taking a series of photographs of the pursuit of Admiral Graf Spee’s squadron from the upper works of HMS Invincible. Duckworth was posted out of Invincible before the Battle of Jutland. He went on to write an authoritative handbook on Naval court martial proceedings. The stock of his book was destroyed during a German air raid on Plymouth in 1940. It was the practice of Royal Navy officers in the First World War to form syndicates and buy a camera. An officer with a non-combatant role would take photographs during action, which would then be sold to the press.